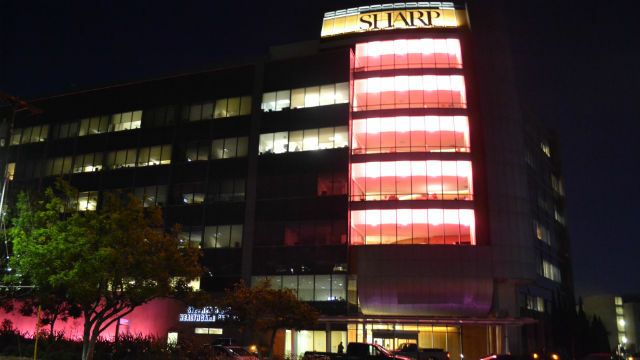 Sharp Memorial Hospital and the adjacent Mary Birch Hospital for Women & Newborns are turning pink in honor of Breast Cancer Awareness Month. Beams of pink light will shine along the outside and inside of the buildings to bring awareness to breast cancer and honor those affected. According to the Centers for Disease Control, breast cancer is the most common form of cancer in women. Approximately one in eight women in the U.S. will develop invasive breast cancer sometime in their lives. More than 200,000 new cases — and more than 40,000 deaths — were reported in the U.S. in 2014. Sharp Memorial offers a nationally recognized breast health center that focuses on early detection and advanced treatment of all breast conditions.